We remember the admonition of our mothers: "Treat others as you want them to treat you." But what if being nice was something we were inclined by nature to do anyway? 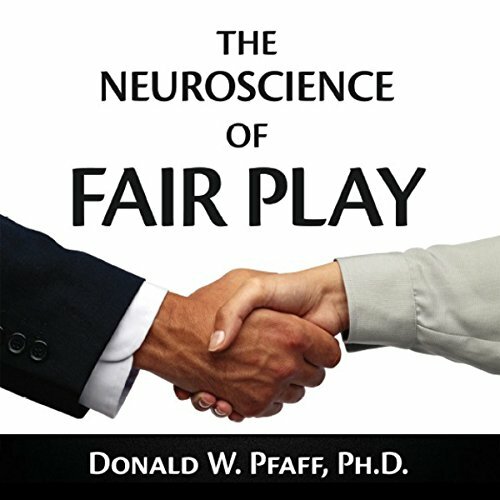 Renowned neuroscientist Donald Pfaff upends our entire understanding of ethics and social contracts with an intriguing proposition: the Golden Rule is hardwired into the human brain. Pfaff, the researcher who first discovered the connections between specific brain circuits and certain behaviors, contends that the basic ethics governing our everyday lives can be traced directly to brain circuitry. Writing with popular science journalist Sandra J. Ackerman, he explains in this clear and concise account how specific brain signals induce us to consider our actions as if they were directed at ourselves - and subsequently lead us to treat others as we wish to be treated. Brain hormones are a part of this complicated process, and The Neuroscience of Fair Play discusses how brain hormones can catalyze behaviors with moral implications in such areas as self-sacrifice, parental love, friendship, and violent aggression. I received this audio book as a gift in exchange for a honest and unbiased review. There is tons of information in this book. I had no idea of how deep the conscience goes or how the brain triggers hormones. I was surprised by some of the test results too. This book explains how the brain is wired and how we know that, along with how are behavior is due to our wiring. The author, Donald W Pfaff, Ph. D. did a good job researching all this information and writing this book. It is very detailed. The narrator, Jack Chekijian delivers a flawless read of this book, making it easier to follow along. The theories seem OK for as far as they go, but seem a little simplistic to me. Having worked with TBI patients for some years, and jail populations for a similar time, the premise of addressing only theoretically undamaged subjects while seeming to be a proponent of chemical applications for all just doesn't sit very well. Still, it is certainly an interesting piece, and surely on many course reading lists. Narrator Jack is very good at performing course material. His narration is given at a pace which easily allows for note-taking without having to do the stop/start thing. Combine that with a pleasant voice and clear diction, and you have a winner.